In August last year, I photographed the wedding of Scott and Craig at Maryculter House. It was a stunning wedding with great attention to detail, including Alpacas delivering the rings, a beautiful set up at Maryculter, a nice sunny (but windy) day, and superb entertainment from the Big Show. Scott and Craig were delighted with their images. They then chose their favourites using our on-line system, and then met with me to look at the images on my screen and discuss options, and decided to have a book. The pages were deigned and presented to them on-line where they could comment and suggest changes. After all the changes were made, we met again to look at the book at actual size on my 38 inch screen which previews the book exactly. At this meeting, they chose the style (Young Book), with an acrylic cover with grey spine and back, in a white box with grey text and ribbon, matching the wedding theme. We are both delighted with the book and all our family thinks it is stunning. 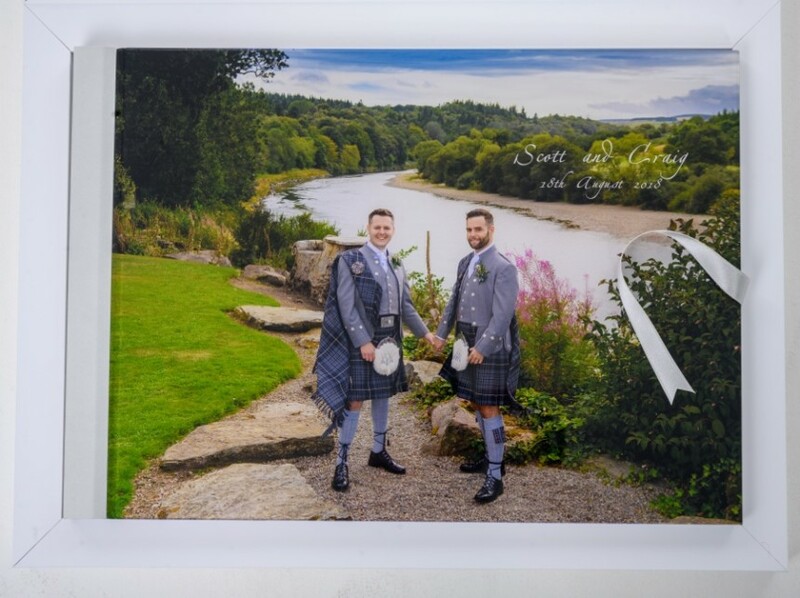 The ultimate way to present your wedding images is in a stunning Italian Graphistudio book which can be fully personalised from a huge range of materials and options. Our page preview system is second to none and all of this ensures you can get exactly what you want. With sizes ranging from 30×20 to 50x40cm, and a wide range of cover options, you can get something very special and to fit your budget. As well as designing and supplying books from our own wedding photographs, we often create books for clients who have their own images taken at ceremonies abroad, or from images supplied by their photographer. We just ordered a book this week for a couple married at Loch Lomond where they bought the digital files.